‘Blowtorch’ threat against road-link builders: Good Media Coverage – Community Rally a Success! 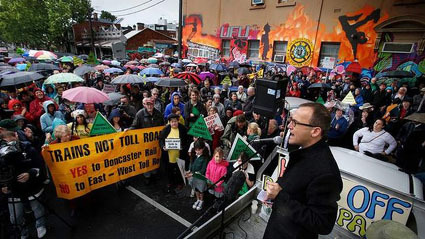 Call to arms: Greens MP Adam Bandt addresses an anti-tunnel rally in Fitzroy. Photo: Eddie Jim. Opponents of the east-west link have pledged to move their protests to the companies short-listed to build the multibillion-dollar project. About 300 residents gathered for an anti-tunnel rally held in Fitzroy on Sunday, the latest in a series of community-led protests against the controversial proposed tunnel. Socialist and Yarra councillor Stephen Jolly said protests so far had been focused on test drilling sites but would soon shift to targeting companies with prospective ties to the project. ”We’re going to be putting a blowtorch to their backsides in the next few weeks. And anyone that wants to put their grubby little hands on this project will be targeted,” he said. The Napthine government is considering three consortium bids – East West Connect, led by Lend Lease, Inner Link Group, led by Spanish infrastructure giant Cintra, and Momentum Infrastructure, led by John Holland, which is owned by Leighton Holdings. John Holland’s head office is based in Abbotsford. Linking Melbourne Authority announced on October 10 that it had completed test drilling across Collingwood, Clifton Hill and Fitzroy. One hundred boreholes were dug for geotechnical drilling tests. Those who attended the rally celebrated a series of protests in the past three weeks that delayed drilling in different parts of the inner-north and brought national attention to their cause. Several claimed that the final four borehole sites had been abandoned because of their actions. One resident said the community had previously been successful in saving Richmond Secondary College, Fitzroy High School, Fitzroy Pool and Abbotsford Convent, and was confident residents would again end up victorious in their latest battle. ”We’ve had a long history of taking on the government in this area and winning,” he said. Once completed, the 18-kilometre cross-city tunnel will connect the Eastern Freeway to the Western Ring Road. The Napthine government has stated the project will reduce congestion. Planning is under way for the first section that will link the Eastern Freeway to CityLink. A caravan has been set up at the corner of Brunswick and Westgarth streets as a full-time meeting and information area for residents. Federal Greens member for Melbourne Adam Bandt, state ALP member for Richmond Richard Wynne, comedian and activist Rod Quantock, and residents affected by the project also spoke at the event.